Excel. That is the most frequently cited writing tool we hear of in the game industry. Excel. For creative writing. The unfortunate truth is that writing in the game industry is still treated as a minor role, an afterthought. Writers are, by and large, only brought in at the last minute, in order to pen the snappy dialogue that's barked out when enemy soldiers lose sight of the player behind a crate. But more recently, narrative games have been gaining traction, especially among indie developers. Our industry is telling stories better than ever, whether it's the elegant back-and-forth radio dialogue from Firewatch , the spooky teenage drama from Oxenfree , or the rampant cannibalism in Sunless Sea . So, what became ink evolved throughout the first two years and our initial projects. Initially it was very simple - sections and subsections could be linked together with "goto" arrows. Choices were indicated with bullet-like asterisks. Of course, we insisted on having our own weaving-based terminology: we called sections "knots", and sub-sections "stitches". It worked well enough for our initial projects, including Sorcery! , an adaptation of the gamebook series by Steve Jackson. But, we also evolved the language over time. The biggest change in the early days was the addition of a feature called "weave", allowing the writer to structure intricate branching easily using a hierarchy of indented bullets. It's perfect for writing dialogue, and was pivotal to the writing style in 80 Days . For a full tutorial of ink, see this tutorial. However, if you're just here for a taster, I'll run over a couple of our favourite features. In weave, the flow always moves downwards. It's impossible to have "loose ends", a common issue if you link together your story via the traditional method of "goto" arrows. After an indented section ends, the flow automatically pops out to the next level of indentation. To see this in action, let's step through the above example. Broadly, the sub-sections in weave are demarkated by the '-' marks, which we call gathers, since they're also the join points for when the flow runs out. So, we begin with the text "I looked at Monsieur Fogg", and then immediately have two choices, denoted by the single asterisks: "... and I could contain myself no longer. ", and "... but I said nothing", which is right down at the bottom. As you can see, each time we make a choice, we're going deeper into the indentation. By the time we get to the triple-indented choices, we have two more choices, but the flow automatically stops when it sees the triple-indented gather point: the "- - -". After the player makes one of the choices, this is where the flow will continue. Now, the slightly more tricky part. Let's see what happens when the player picks the choice "'A modest wager, I trust? '", below. After it leads on to the line beginning 'Twenty thousand pounds', we've run out of content at the triple indentation level - all the other content was part of other choices. So, the flow continues to walk down until it finds the next gather point at an outer level of indentation. In this case, the next point it will find is the line: "- - After that,". Again, it runs out of content, so it has to jump outward again, to the final line: "- we passed the day in silence.". Finally, in case you're wondering what the "<>" does, we call it glue. It automatically makes sure that any content that comes before or after is joined together on the same line, making the final line of content "After that, we passed the day in silence." And that's the end of the section; hopefully you made it out of the weave with your sanity intact! Yes, it can be a little tricky to get your head around initially, but once you've got it, it's extremely powerful. It's fast, succinct, focussed on the words, and doesn't require the writer to spend a great deal of time working out how to wire everything together. 80 Days ' main content was written almost exclusively in weave - Jon had already been moving much of his writing over to the format, and Meg Jayanth loved it. It also perfectly suited a new writing style we were experimenting with. We wanted to evoke the feel of the player writing in a diary, so often we would provide choices that were formed out of partial sentences. Passepartout would start a thought, and the player would finish it, or vice versa. The choice text is "'Ah. '", but when chosen, the game displays "'Ah,' I replied". It does this by splitting the text into three parts: the part before the opening bracket, the part within the brackets, and the part that comes afterwards. For the choice itself, it uses the first two, while for the output it uses the first and last. This example is quite different - we're no longer looking at weave, but at a single piece of content (with no choices), that we would argue is approaching procedural narrative. The extract is from Sorcery! Part 3 , in which we have a day-night cycle. The player must choose to sleep if she wishes to regain her stamina each day. Because this is a repetitive action, there's a single piece of content in ink format, but it can come out of the engine in vastly different ways depending on the player's circumstances. Without explaining every part in detail, what you're looking at is a series of nested pieces of logic: including both cycles and conditionals. Each of those logical pieces is rather simple on its own. Each time the player reads the content, she'll get different text from a cycle block, to vary it and keep it interesting. Meanwhile, the conditionals allow us to present different variations depending on, for example, whether the player is in a forest, or whether they happened to get very wet somehow earlier that day. Laying your pack down by the cliff-edge, you try to settle despite the cold. Putting down your pack by the roots of a tree, you try to stretch out despite the shivering cold of your still-wet clothing. If this looks a bit technical or complicated, that's because it's one of the most complex pieces of individual writing in the game! And we shouldn't be afraid of content like this. One thing that we're learning about the role of writing in game development is that the technical spectrum can be just as wide as other disciplines. Technical artists may know how to write shaders, but that doesn't mean that concept artists are entirely "non-technical" - they all know complex tools like Photoshop. Or worse, Maya. In exactly the same way, Jon Ingold is our "narrative architect" - he is at the very technical end of the spectrum, designing and constructing the narrative structures and systems (in ink), as well as writing the entirety of the Sorcery series, and a good chunk of 80 Days . Meanwhile, Meg Jayanth did huge amounts of world building and research for 80 Days , and wrote the majority of the words. She was still writing in weave though - I'd hardly call that non-technical! Why did we open source ink? Ink has proved to be the one technological constant of our company - the bedrock on which we've built and shipped eight games (and counting!) to a number of platforms. So why would we open source such an important asset? Either we could keep it entirely to ourselves, or we could sell it to other game companies. No one expects us to open it up to the world, it's our technology after all. But for some reason, open-sourcing just feels right. We know it would be hugely valuable to other developers and writers, especially those who are used to Excel and Word. Ink has been designed from the ground up to have a certain set of affordances. With features like weave, it lends itself to crafting narratives with the kind of complexity, pacing and depth that we ourselves enjoy. So, part of our decision to open source ink is rooted in a genuine desire to improve interactive storytelling in the industy. However, we have absolutely no interest in becoming a service or middleware company. 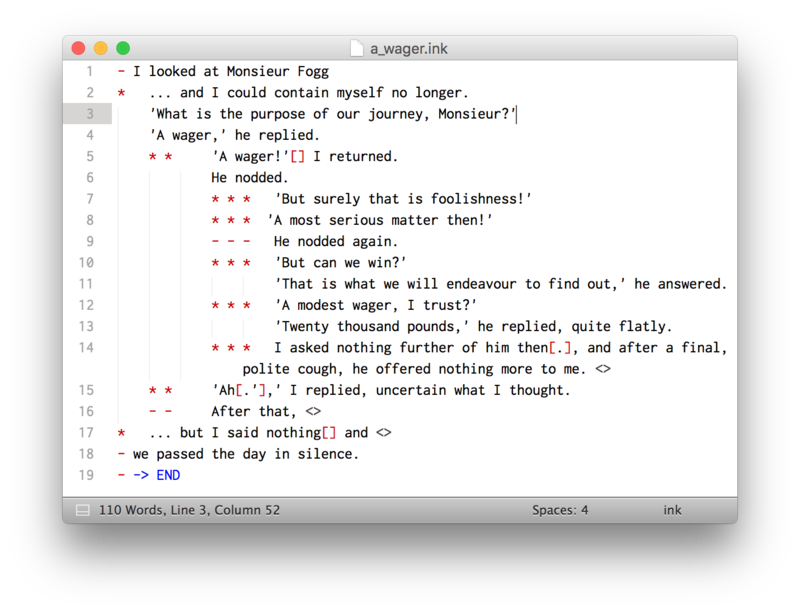 The talented guys at Stoic, who developed The Banner Saga (and its tantalisingly imminent sequel), used inklewriter , our entirely unrelated web-based tool, which we licensed to them for commercial usage and support. I feel personally very proud to have collaborated with them in a small way, and simultaneously embarassed that inklewriter was the best tool for them. It's a tool that's really designed for amateurs and hobbyists, and while we're happy that Stoic made it work for them, we're also aware that we were sitting on a far more powerful system with ink. We also realised that while we were happy to support Stoic on The Banner Saga , if we started charging more than a few developers to use our tech, it could become a distraction, despite being a potentially valuable extra source of revenue. Building our own games has to come first. Large corporations like Google have demonstrated that making technology freely available can bring surprising benefits. (No, we're not going to start relying on advertising revenue!) Going open source can create a community around technology. Other developers may be tempted to support ink, bringing bug fixes and new features. The larger an open source community grows, the stronger it becomes. A personal dream of mine is that one day we'll look at a writer's resumé and see ink as one of her core skills. Maybe, just maybe, ink could become an industry standard. It may never happen, but I can dream, right? We've never managed to localise our games - there are too many words in Sorcery! and 80 Days , and individual translators would have to learn ink and be excellent creative writers themselves in order to produce a "true" translation. But what if translators came to a project already knowing ink? What if another developer builds a tool that can verify that a translation of a game has the same logical structure, despite differences in the words themselves? Again, it may never happen. But we'd be hugely excited to simply find out that another game that's as good as The Banner Saga made use of ink. Interested in giving ink a try? Then head over to the github repository and download the latest release!